One aspect of Sunshine that was very apparent to me was the way in which the film’s pace oscillates between the speed of an arthritic snail and Usain Bolt on cocaine, somewhat like Inglorious Basterds but in a much less crude and unrefined manner. As the movie progresses, the crises become more frequent and more intense, both of which are intensified by the very tame opening scenes. This will come as no surprise to most of you, but one of my favourite films of all time is Ridley Scott’s Alien; intensely minimalist, claustrophobic and so tense that I fear my knuckles will never regain their colour. One of the signature stylistic nuances of Alien is the long single-shot scenes depicting corridors and the ship’s exterior, something Boyle has picked up and emulated spectacularly. If it hadn’t been for some of Boyle’s archetypal directorship, I could easily have mistaken Sunshine for Ridley Scott’s work, something I maintain is a good thing. Boyle’s method for instilling suspense in his audience is to use a disorienting mix of graphical layering, bright lights and fleeting glimpses of some previously-unseen evil, usually all at once. The scenes involving Pinbacker are like this, so much so that we never actually see Pinbacker for more than a split-second, and even then we just see shadows and scorched flesh. The anthropological value of the movie comes from the situation in which the characters are placed; the intense solitude of space combined with the mind-crushing responsibilty of redeeming the entire human race. As Capa – Cillian Murphy’s character – says; ‘eight astronauts strapped to the back of a bomb’ makes for some very interesting character developments. Having said that, about half of the characters are utterly two-dimentional and entirely forgettable. Sunshine‘s similarities to Alien peak with the depiction of the crew; in a scene barely dissimilar to the infamous Chest-burster Scene in Alien, the crew of the Icarus II sit in a dingy dining room eating rations and discussing mundane matters. Alien was the trendsetter in the utilitarian NASA-style spacecraft design – another theme on which Sunshine draws heavily – but also the measured space scenes; a strong contrast to such blockbusters as Star Trek and the Star Wars prequels. A convention that I have noticed in Danny Boyle’s movies is the way in which he masterfully balances sanity with insanity; realism and surrealism, shows us how thin the dividing line is, then crosses it with increasing frequency and depravity. For example, in Trainspotting, he contrasts the gritty realism of the Edinburgh drug scene with the surrealism of Ewan McGreggor diving into a toilet and a baby with a rotating head á la The Exorcist crawling on the ceiling. On an inferior note, the soundtrack sounds like a jamming session between Godspeed You Black Emperor and Frederic Chopin’s reanimated zombified corpse, but it’s good anyway; very atmospheric and appropriate for the subject matter. Cillian Murphy gives a fashionably taciturn performance; my estimate is that he has another two rolls as sullen soft-spoken characters before he is permanently typecast forever. 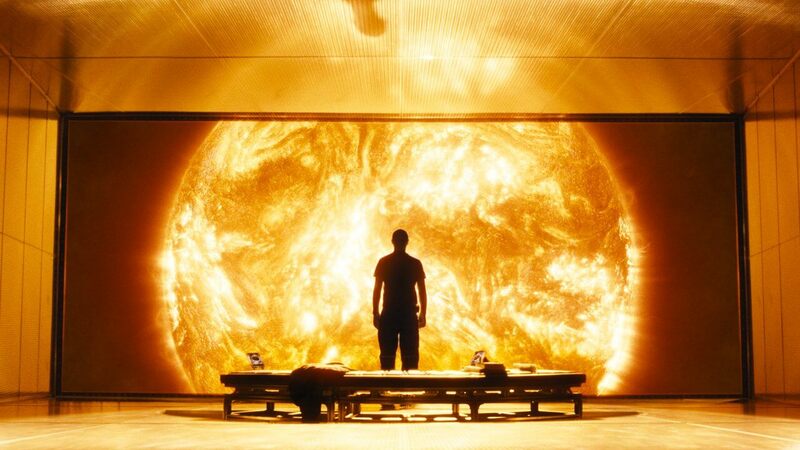 I’m giving Sunshine a 7/10; I thoroughly enjoyed the movie, though I feel it borrowed just a bit too much from Alien. But that’s just my opinion.